For most of 2013 I stayed right on track with my Sugar Block Club blocks, but then I fell behind sometime in the fall. Finally, I'm finished all the blocks, and yes, I do realize we are now a full four months into 2014. Better late than never! This is the Novemeber block, which I actually pieced a few months ago but didn't share here for some reason. I was a little disappointed in the block when I put it together. The print is the same in both blues, so I find the block feels flat even though there is good contrast in their values. 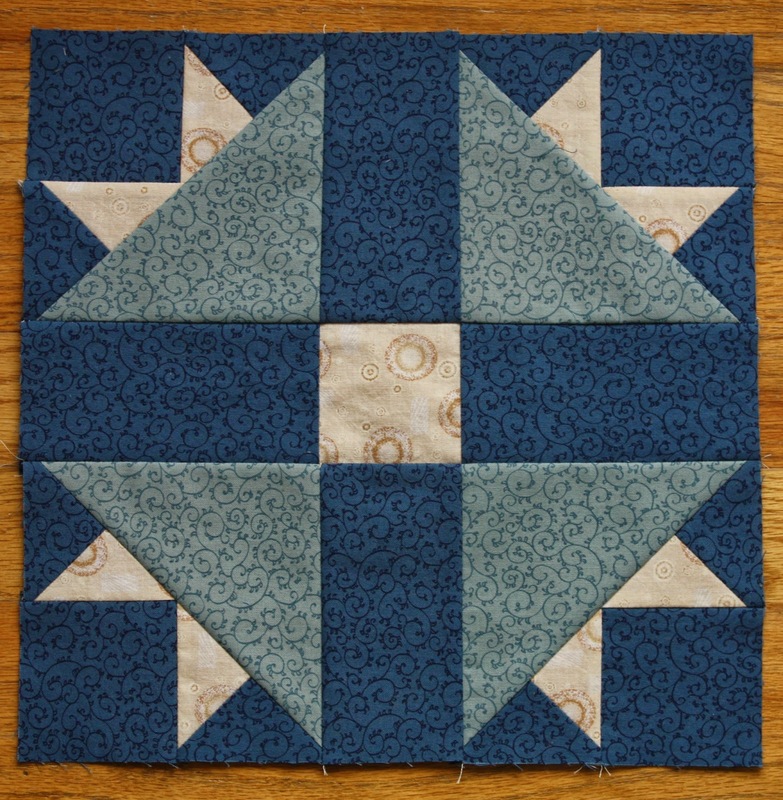 This is the December block, which I pieced over our spring break last week. It is one of my favourite blocks of the whole series. Here are all twelve blocks together. I'm not happy with the block in the bottom right corner. That blue/tan print feels out of place with the rest of the blocks, all of which have smaller scale/more subtle prints. I may remake that block, I haven't decided yet. If I do remake it, this version could end up on the back of the quilt. I also haven't decided how I want to put them together. I'm thinking maybe on point, with plain blocks and sashing. I don't know what colours to use for the alternate blocks or sashing, though. A darker brown, a blue, or something different entirely? I'm pretty sure I'll have to make the decision in a store and not in front of my computer. I'll need to lay the blocks out with possible fabrics in order to see how they work together. If you have any suggestions, I'd love to hear them. It feels good to have all the blocks made at least. 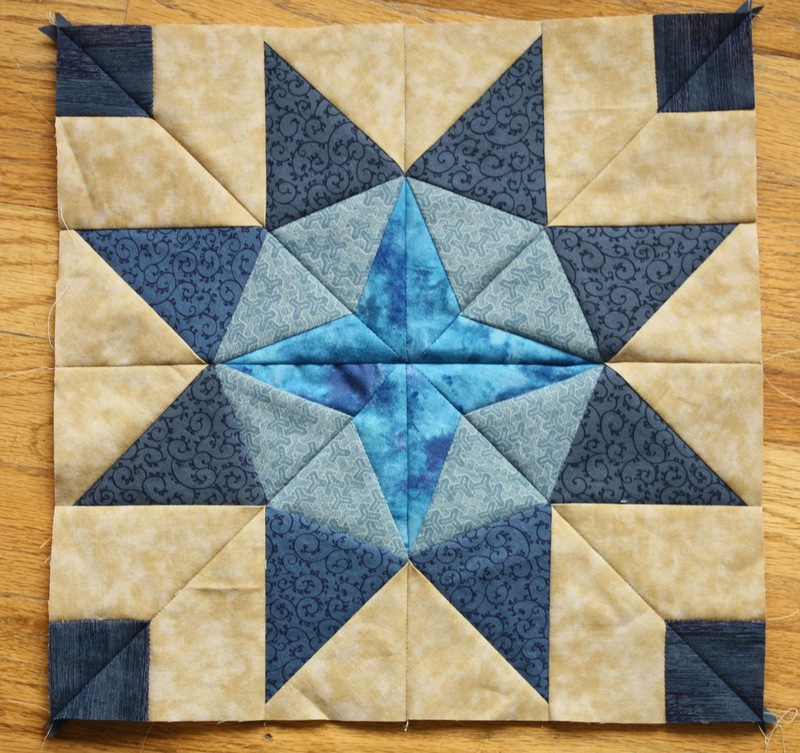 I'm planning to gift this quilt, but the deadline is pretty far away yet. Of course, judging by how long it has taken me to quilt my Scrappy Log Cabin quilt, I better get this top assembled and basted ASAP! As usual, I'll be linking up to these places. Congratulations on getting these blocks finished, the December block is lovely I can see why it is your favourite. ooh! these blocks are great! Thank you so much for partying at Needle and Thread Thursday! It doesn't need to be done again!